Aloha! 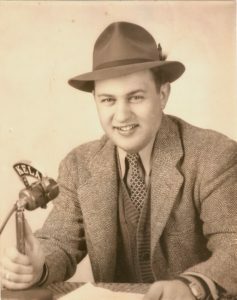 If you found this web site, you probably have an interest in learning more about Les Keiter, the legendary sportscaster. Les’ youngest daughter, Cindy Keiter, and I (her spouse, Lory Henning) are putting together this informational tribute to Les’ life and work of 50 Years Behind the Microphone (also the title behind Les’ book). Please note- the 30 JOBS we will be listing do not include every freelance job Les covered while doing all of these, i.e. every basketball, golf match, boxing match, etc. that he got asked to do along the way. He called for instance, many fights for the Monday Night Fights at Eastern Parkway, Brooklyn, the many bouts he called while in the Navy for the Armed Forces Radio Network, and the many fights he called in Hawaii during his first tenure there in 1949-50 in the old Honolulu Stadium (affectionately known as, “Termite Palace”). At this time we don’t have a record of each individual bout. Les Keiter was born in Seattle, Washington-April 27th, 1919, and he died in Kailua, Hawaii- April 14th, 2009. Les was 89 years old.